The role of the financial planner has evolved over the years from a transaction oriented approach to a consultative values-based approach. We no longer are the sole bearer of knowledge for our clients: at a click, if they so desire, the client can obtain vast amounts of information on the internet on investment products, insurance carriers, broker dealers and financial planners. Our role is to integrate the information the client could obtain and knowledgeably guide them toward a clearer understanding of the products available, and if suitable for their risk tolerance, time horizon, and objectives. We must be the financial problem solver for our client, allowing them to focus on life's other concerns, while having confidence in our experience, to ethically guide them toward achieving their goals. Integrity- We will be honest and maintain open lines of communication. We will never make recommendations for our own personal gain. Objective Analysis – We will always remain a professional and never allow our personal biases to be a part of your plans. 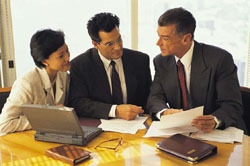 Fairness –We will disclose any relationship that may be a conflict of interest and possible obstacle toward your goals. Confidentiality – We will never disclose any information about your accounts to anyone unless you provide a written request. Establish Relationship with Client and Build on Financial Planning Team, coordinate efforts of other team members-Attorney, CPA, Third Party Administrator, Mortgage Broker. Plan development will be a process with consideration to the client's risk tolerance, suitability, time horizon and objectives.